May 26, 2010 By Grant Cunningham & filed under All Articles, Handguns, Self Defense Firearms. Today’s lightweight revolvers are a joy to carry. Small and bereft of mass, they ride easily in a pocket and even more easily in a belt holster. If you can tolerate the high recoil impulse of full-power defensive ammunition, they are a viable choice for concealed carry. A recent and extensive repair job for one of my clients reminded me that there is a downside to these pocket rockets: they simply won’t stand up to extended shooting like their heavier steel-framed cousins. If you shoot your lightweight enough, you will wear it out. How soon? That depends on how you treat it. In days past, the major concern of these “alloy framed” guns (in quotes because technically steel is an alloy too) was frame stretching. In a light gun, defensive-grade ammunition develops a greater recoil impulse than it would in a heavier model. That force is channeled by the frame, and each round fired distorts the frame just a tiny bit. Over time those tiny distortions accumulate, and the result is called frame stretch. When a frame stretches, the cylinder develops front-to-back play, which is called endshake. As that increases, the cylinder acts like a slide hammer, battering the frame and accelerating frame stretch. At some point, the frame can stretch enough that the critical headspace—the distance from the cartridge head to the breech face, or the area where the firing pin protrudes—will increase beyond safe limits. The only remedy is a new frame, which translates to a new gun. The most common cause of excess movement is a worn latch pin hole. Over the last couple of decades, revolver manufacturers have improved the metallurgy of their lightweight guns to better resist the accelerated wear of full power and +P ammunition. Their work has improved longevity considerably, and today’s titanium and scandium guns have made frame stretching far less common than it once was. Because of this increased durability, these revolvers have a longer service life. They’re being shot more, and we’re now seeing some types of wear that weren’t a concern back when the frames wore out before the other parts! Most wear issues concern cylinder lock-up—how well controlled the cylinder is when a round is fired. There are several wear points that can affect how tightly the cylinder locks at the point of ignition. Safety first! Make sure that the gun is unloaded, then double check it. Remember to keep the muzzle pointed in a safe direction during your inspection. First we’ll check for cylinder latching. Close the cylinder and gently push it side-to-side without rotating it. (That’s easier said than done!) If there is any side play, you may have a worn latch pin. Pay particular attention to the gap between the yoke and frame (at the front of the frame, under the barrel). If latching is extremely worn, you’ll see that gap widen significantly as you move the cylinder. The latch pin hole is where the pin in the center of the cylinder’s ejector star drops. The most common cause of excess movement is a worn latch pin hole. This hole, directly under the firing pin, is where the pin in the center of the cylinder’s ejector star drops. As the cylinder rotates, so does the pin. Friction between the steel pin and the aluminum frame can result in wear, and recoil can deform the walls of the hole, making the situation worse. In extreme cases, this necessitates replacement of the frame. Next, check for rotational play. At rest, it’s normal to find a very small amount of play as you try to rotate the cylinder by hand. Any excessive amount can indicate a worn cylinder stop—that little part at the bottom of the frame window that pops up to lock the cylinder. It’s not unusual for that part to wear, or to cause the slot in the frame through which it protrudes to widen a bit. The solution is to replace the cylinder stop, which usually fixes the problem, assuming that there aren’t any other problems! The reason we checked cylinder latching first is because a loose latch can easily be mistaken for a worn stop. If the latching is sufficiently worn, replacing the stop won’t cure the problem. It’s not unusual to find both problems in a heavily used gun. We also need to check for rotational play at lock-up. Point the muzzle in a verified safe direction, pull the trigger, and hold in the rearward position. Check for rotational play again. If there is any, it indicates a worn hand and/or, once again, a worn cylinder latch. Finally, check for cylinder endshake. Endshake is the back-and-forth of the cylinder when the trigger is at rest. There should be very little, roughly the amount of a sheet of standard notebook paper. Any more than that requires attention, even more so than on a steel gun. A cylinder with excessive endshake will accelerate rearward under recoil, impacting the frame. The part that impacts is the extractor star, and in severe cases the very small surface area will imprint itself on the frame, further increasing the endshake. At the same time, all the other parts we looked at will experience increased wear because of the cylinder moving against them. Though listed last, endshake is really the first thing that needs attention, as it can shorten the service life of your gun considerably! The best way to keep your lightweight revolver running is through proper maintenance. The most important thing is to keep it clean. Dirt is an abrasive, and when caught between a steel part and an aluminum one, the softer metal will wear first. An excessive amount of rotational play can indicate a worn cylinder stop. Clean the latch pin thoroughly; do not oil it. That part of the gun gets quite dirty, and any oil will carry that dirt to the walls of the frame hole, where it will slowly abrade the aluminum. I’m a believer in shooting my carry guns—it’s a vital component of realistic training. 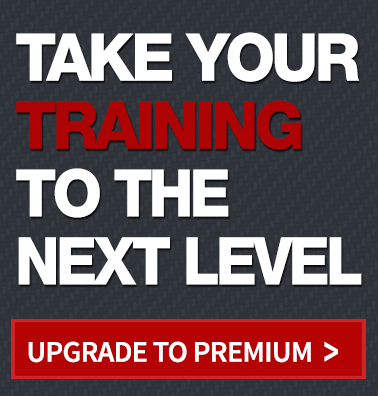 Of course, if you train as often as you should, this translates into a significant number of rounds through the piece. Here’s the Catch-22: if you shoot the gun as you would in an actual encounter and you practice often, you’ll wear the gun out faster. One very good way to prevent that is to use standard pressure loads for practice. Of course, they don’t recoil as much as full-power defensive loads, which makes them less realistic! If you expect to train as realistically as possible, you’ll have to accept that your gun will experience accelerated wear. One compromise is to do the majority of practice with reduced recoil loads, then at the end of your session, run some full-power fodder through the gun to reacquaint yourself with its recoil characteristics. The best option is to buy a duplicate gun and reserve it for practice. This is the expensive way around the problem, no doubt, but it does have the advantage of giving you a second gun for those times when your primary is getting checked. If you shoot one of these lightweight wonders on a regular basis, you should definitely send it to visit the gunsmith occasionally! Nice job grant. Well presented and simply stated. Thanks for the information. Great article as usual from Grant. What is that beautiful holster you are wearing with your SP-101 in the first photo? Love it…. Need to get one for my GP100. All you spammers need to GFY. I’ve been carrying and shooting a snubby for forty nine years and can say that the article is pretty much spot-on. Of course, the holstered revolver in the picture above is certainly not considered a lightweight. 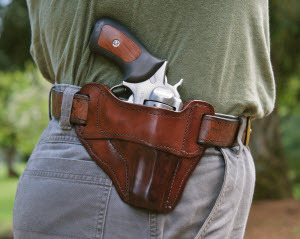 Nice holster shown for article, is it a custom? Because it’s a revolver, I’m speaking for myself, I probably have only shot 200 rounds on my back up carry. Maybe even less. I have the ruger LRC 38+P. And we qualify for it once a year. When I target shoot it, I used regular 38 rounds and avoid +P ammo. Thanks for the info. What revolvers are you talking about exactly? Not those such as the Ruger SP101, or GP100? Hi Gregory. The revolvers that were being referred to are those such as the Ruger LCR with the 7000 series aluminum, Smith & Wesson Airweight, and others similar from various manufacturers where the frame is made from a lightweight alloy. about how many rounds (roughly) are usually fired in an airweight (say, a 642) before the symptoms mentioned start to appear? what do you think the service life of an aluminum j-frame might be, as opposed to steel? That’s a very tough question because there are so many variables involved and the lack of really high-round-count examples of the Airweight-class guns. Even mine have only been shot a few thousand times apiece, simply because they’re not really all that pleasant to shoot! Anyone who tells you they can predict how many rounds an Airweight will shoot is simply guessing. The 642, like all the “J” frames, is a small gun with small parts. Its working surfaces are small, and there’s a large load placed on them every time the gun is fired. I’m not surprised when I see timing issues in the aluminum-framed guns with less than 2,000 rounds, particularly if they’re all of the +P variety. Timing is a repairable issue, though. We’re really more worried about things which would render the gun unfit for further use, which usually boil down to frame stretching and wear in the frame pivot hole where the center pin of the cylinder latches and rotates. Aluminum frame stretch happens, especially with +P rounds. Shooting standard pressure loads will keep frame stretch to a minimum. 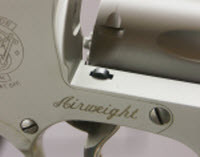 I’ve seen old Airweights that have always shot standard pressure loads and the frames were still within acceptable tolerances. If you shoot all +P ammo, you can bet on eventually stretching the frame. As to the hole wear, if the gun is kept clean the hole won’t wear as quickly. The Airweights I see with the problem are almost always police backup guns that weren’t kept clean. In some, the frame hole started getting significantly egg-shaped by the 3k mark. If it’s kept clean, I would think the lifespan would at least double. I know it sounds like I’m equivocating, but as I said it’s hard to come to any specific conclusions because very few people shoot the aluminum guns all that much. Regarding the steel guns, that’s easier because you can find steel J-frmes that have been shot a lot. 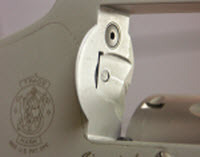 I’ve yet to see a steel J-frame with frame stretch, and rarely do I find one with critical center pin hole wear, despite knowing that many of them have seen in excess of 10k rounds. That being said, the internal parts in the steel frame guns are the same as the lightweight models, so you don’t see a huge improvement in round counts before needing a timing adjustment. Because the recoil impulse is better controlled in the steel guns they don’t go out of time quite as fast, and 3k-5k is a reasonable expectation. Having recently purchased a first year run S&W 296 Ti, I was curious of the frame finish on this revolver. It is so white looking. How should one care for its appearance? This is directly from S & W …. Care and cleaning of the revolver’s titanium alloy consists of normal gun cleaning procedures using high quality gun oil and cleaning solvents when necessary. However, under NO circumstances should the cylinder’s chambers (charge holes) or front face be cleaned with an abrasive material such as sand paper, Scotch Brite™, Crocus Cloth, etc. 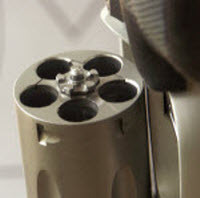 To do so will disrupt it’s protective surface layer and greatly reduce the cylinder’s service life because of excessive erosion that will take place while firing and will void your revolver’s warranty.